The Bentley Bentayga Speed is the world's fastest production SUV, with a zero to 100km/h time of 3.9 seconds and a top speed of 306km/h. Bentley Motors has announced the full details of the Bentayga Speed, the world's fastest production SUV. Building upon the long tradition of Speed models, the Bentley Bentayga Speed is the most powerful and performance-oriented Bentayga to date The Bentayga Speed features an enhanced 626bhp version of the renowned 6.0-litre W12 engine that delivers a top speed of 306km/h and a zero to 100km/h time of 3.9 seconds. Designed, engineered and handcrafted in Great Britain, the Bentayga Speed is the most powerful and performance-oriented Bentayga to date. It builds on a long tradition of Speed models that was born with the Continental GT in 2007 and pushes the boundaries of Bentayga performance further. To match the elevated levels of performance, the Bentayga Speed sports a purposeful exterior look. Dark-tint headlights, body-coloured side skirts and a striking tailgate spoiler hint at the SUV's performance credentials. Dark-tint radiator and bumper grilles, a unique 22-inch wheel design available in three finishes and Speed signature badging add to the sporting design cues. The interior of the Bentayga Speed sports a dramatic design theme that accentuates the car's outright performance Inside, the Bentayga Speed introduces a dramatic design theme. This includes elegantly crafted 'swooshes' around the door and door grab, and on the edge of the seat cushions and backrest bolsters. 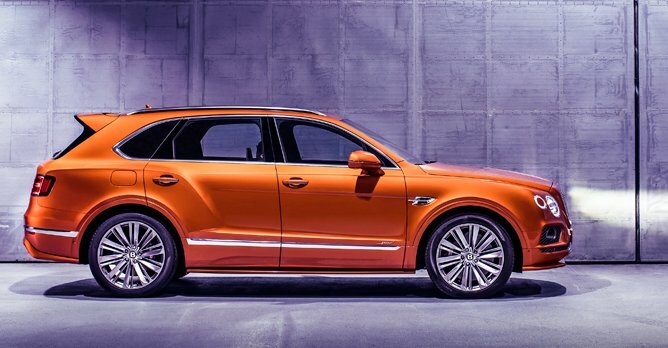 The Bentayga Speed also sees the use of Alcantara for the first time. As with all Bentaygas, the all-wheel drive Speed is equipped with Electronic Differential Lock and up to eight Drive Dynamics modes. Bespoke engineering revisions to the Sport mode provide a more dynamic drive, while a greater exhaust character and firmer suspension tune further increase driver engagement. Customers can personalise the Bentayga Speed to their own requirements with a range of exclusive options. Among them are carbon ceramic brakes, 22-way adjustable front seats with massage function, carbon fibre fascia panels, Bentley rear-seat entertainment and mood lighting.